The Elements stability tab of the Shape sheet is disabled as it is now irrelevant. The reason is that the verifications are carried out with the forces resulted from Second order analysis, in which the imperfections have already been introduced. Member stability according to §6.3 is no longer necessary, as stated in §5.2.2(7)a) from EN1993-1-1. Von Mises stress σVM is based on normal and shear stresses. The Critical Load factor results display the dominant eigenvalue (αcr). 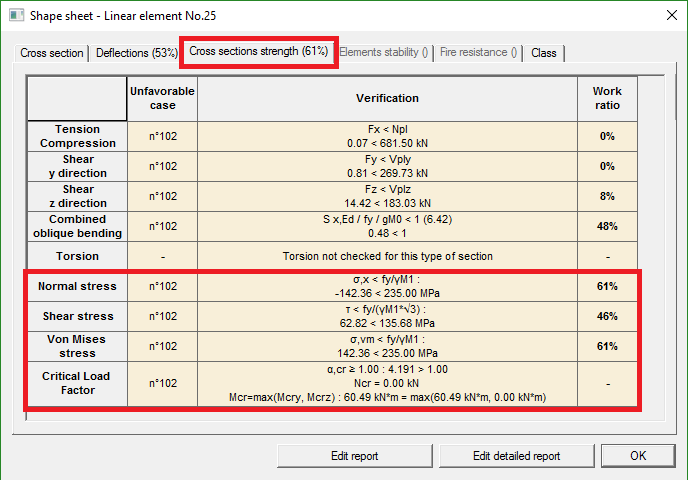 αcr > 1.00 ensures that the element is numerically stable. The Critical Load factor also impacts the critical axial force (Ncr) and the critical bending moment (Mcr) by magnification of the first order forces.